From, LA TIMES: Huddled beneath a large white tent, hundreds of people sang together in the early morning darkness. For hours, they repeated a single word: Hallelujah. They were gathered last Sunday to mark Timket, the Ethiopian Orthodox celebration of the Epiphany. For the faithful, the holiday commemorates Jesus’ baptism in the River Jordan and his revelation as the son of God. Los Angeles’ Timket celebration is the largest in the United States. 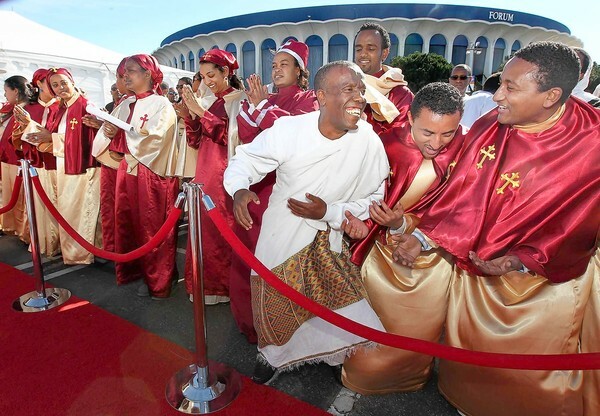 It takes place over a January weekend each year in a parking lot outside the Forum in Inglewood.